Premium Intraocular Lenses — Roll back the years. See more clearly at all distances. of the eye. Presbyopia is not corrected in standard cataract surgery with standard IOL's. after their cataract surgery. In contrast, only 8% of those who had standard, distance-only IOLs were glasses free after their surgery. 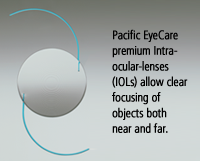 We offer multiple types of Premium IOL's. We analyze your hobbies and lifestyle to determine which one best suits your visual needs.